Before I start describing this incredible American folk art masterpiece, let me say that this first image was taken under strong studio lighting and, while it shows you the details well, it brighter than true-life. Please see the photos below for more true-to-life photos. 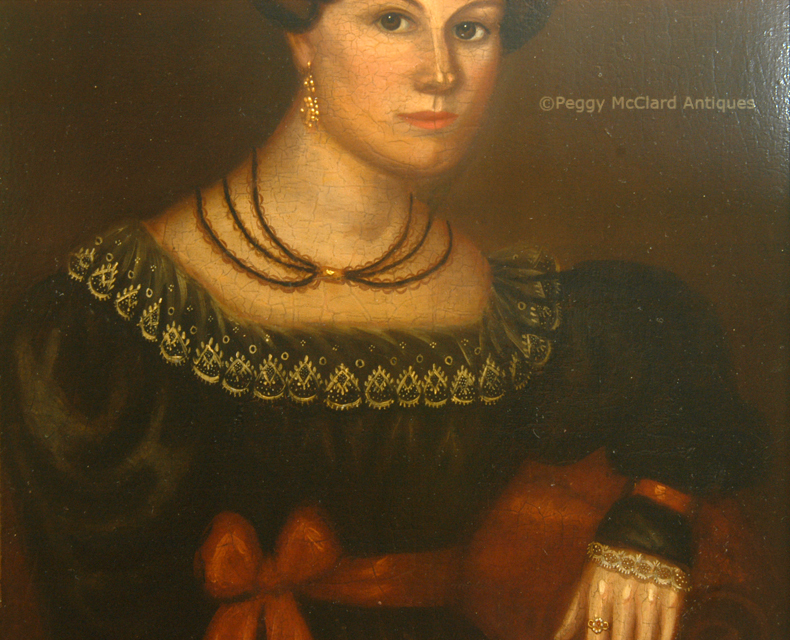 This lovely oil on panel is attributed to American artist Susannah Paine (1792-1862). 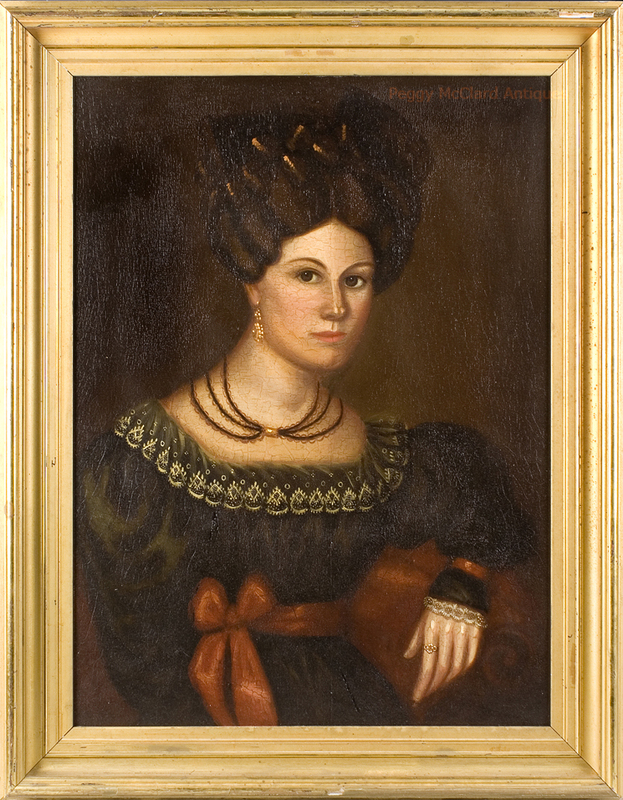 Susannah (sometimes spelled Susanna) Paine was one of the pioneering women artist of 19th century New England. She was born in Rehoboth, Massachusetts to a mariner-father who was lost at sea while she was still a young girl. Paine attended what she referred to as Rhode Island's best girls academy where she was exposed to the art that would later become her professional pursuit. She married James Phillips of Providence in 1819, a man she described as a "taunting, sneering surly tyrant…who enjoyed burning bibles when angry." Their union lasted only 14 months, but before their separation, Paine conceived a child. Her son was born 3 months after her separation from Phillips. She was granted custody of her son in a divorce, but Phillips got all of her property, leaving her destitute. Her son died at eleven months of age. In 1823, at the age of 32, Paine began to travel as an artist. 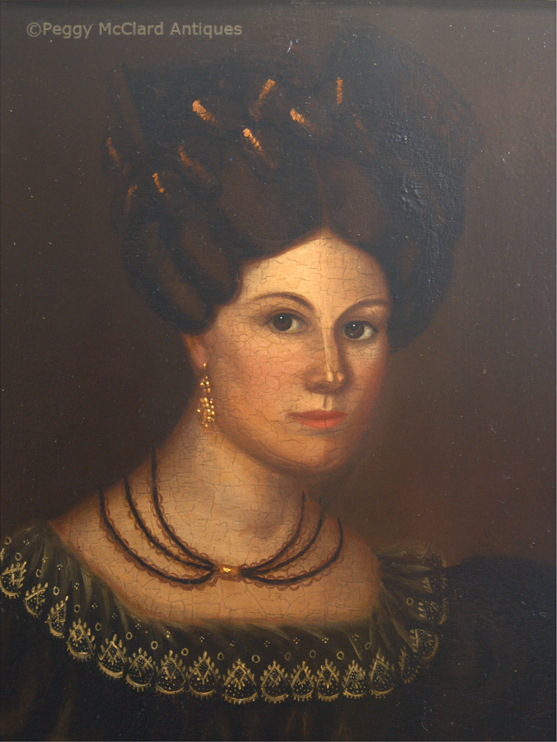 She developed a clientele of women who were proud of having their portrait painted by a woman artist. A letter in the Portland Advertiser in 1827 recognized Paine's portraits and boasted, "Ladies must feel pride and pleasure in patronizing a female artist." PORTRAITS. Miss S. Paine respectfully informs the public that she has taken a room at Mrs. Pritchard's in the new Brick Block, Freestreet, for PORTRAIT PAINTING---her former successes in Providence, where she has been liberally patronized, inspire her with confidence to solicit patronage; as she anticipates a very short stay in Portland, she will put her Portraits at a very reduced price, and will engage to make them to entire satisfaction, or receive no pay---those who will favor her with their patronage will please apply very soon. Price-Oil pictures, $8.00. Do Crayons, $4.00. 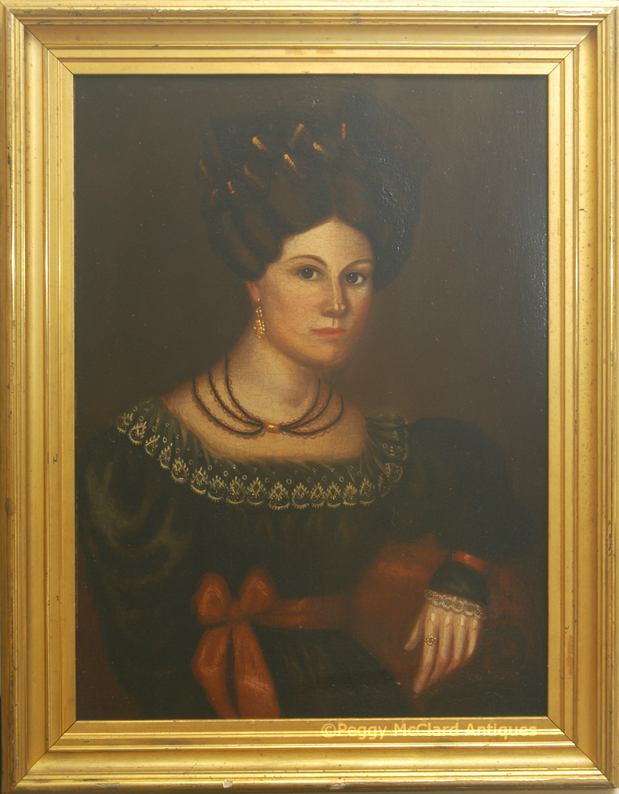 Susannah Paine was active in New England, especially Rhode Island and Maine. 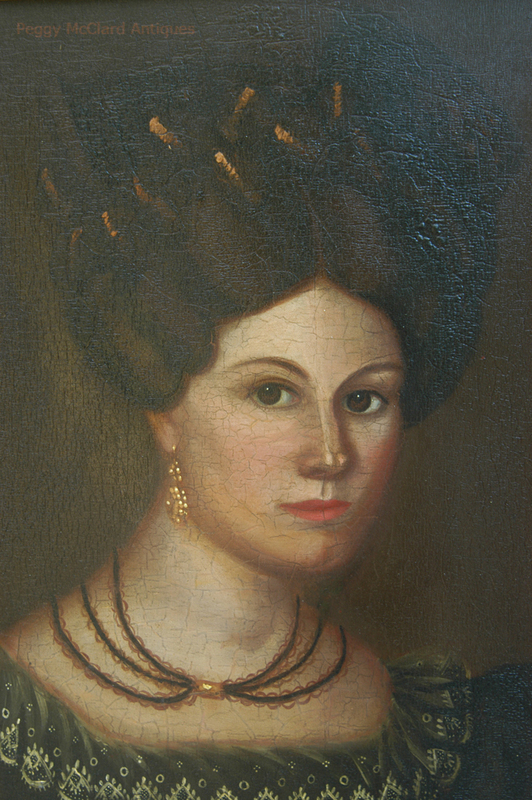 Her work is noted for appealing detail of her subjects such as ornate dress and coiled hair dos, she painted primarily with oil on wood but did an occasional pastel portrait. Her works reside in the collections of the Maine State Museum and the Cape Ann Museum. In 2011, a pastel portrait signed by Paine sold for $32,500. This beautiful portrait resides in a period gilt frame which is likely original. The frame measures 32 1/2" x 25 1/2". The frame has losses to the gilt at the upper right corner and the lower center--both are evident in the photos, but neither provide a distraction to the portrait. The panel measures 26 1/2" x 19 1/4". The painting has cracquelere which has been filled with inpainting. The well-done conservation of this painting allows me to offer her at a better than reasonable price for a Paine. As you may imagine, my photography studio is set up for smaller pieces and I must tell you that I had many problems with the lighting set up of this portrait. I'm showing you many photos under different lighting. I have made notations below the photos about how the lighting affected the coloration of the images. Please view the close-up details which were taken under natural lighting and are more true to color. 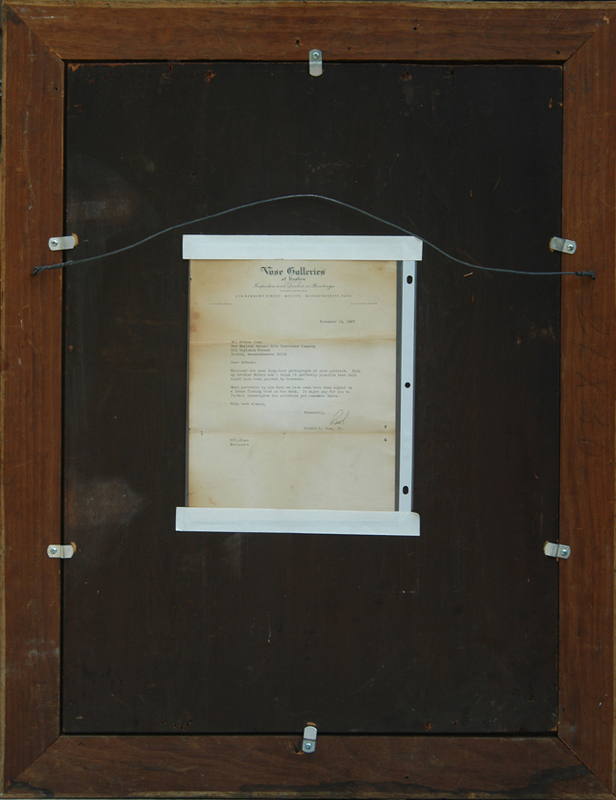 There is a typewritten letter in an archival envelope, taped to the back of the panel with linen tape. 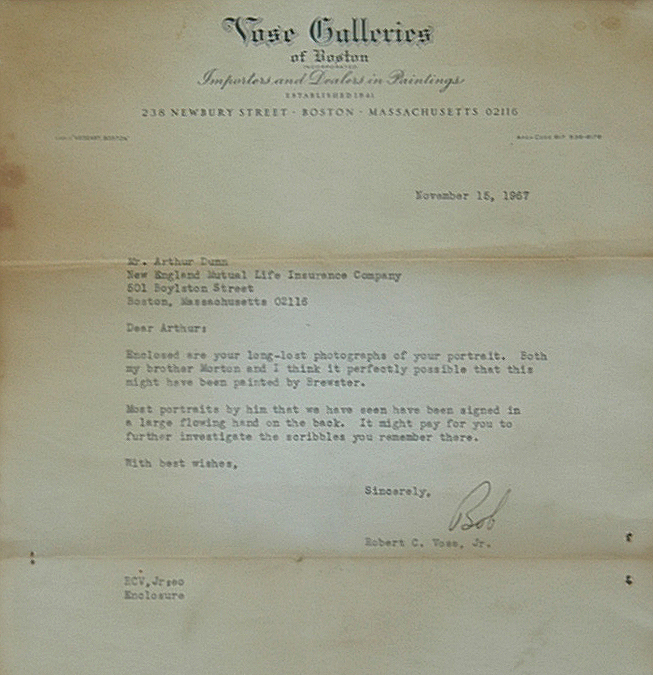 I find the information in the letter odd, and have my doubts that it refers to this painting. The letter suggests that the painting may be by John Brewster and refers to scribbles that the owner remembers on the back of the painting. The panel does not appear to have been painted or otherwise disturbed on the back. I don't see any evidence that there were ever "scribbles" on the back of the panel and this portrait is definitely not attributable to John Brewster, although with scholarship as it was in 1967, someone might have mis-attributed it to him. But, the letter obviously became attached to the portrait at sometime in the past, and I am leaving it in place. This is a really fantastic piece of American folk art, offered at a very reasonable price. The attribution was firmly made by Michael and Suzanne Rudnick Payne who have published two articles on this artist. Framed size 32 1/2" x 25 1/2". 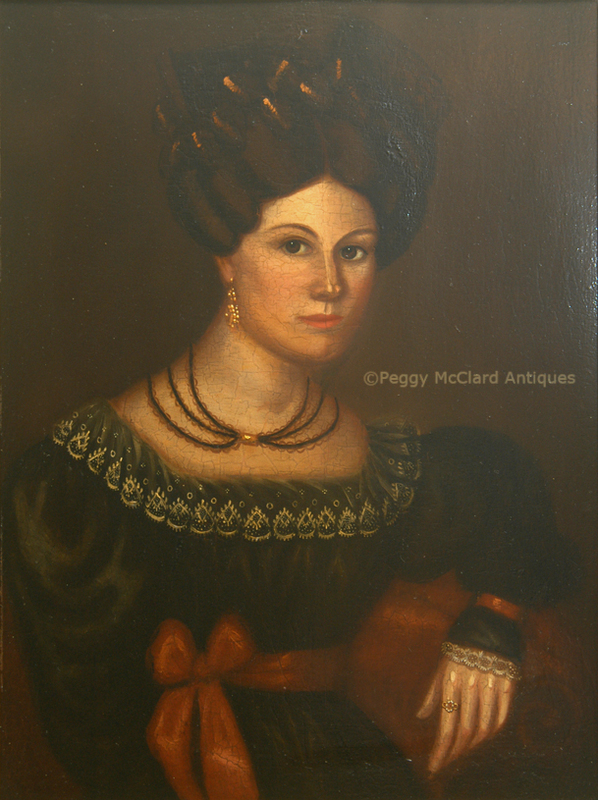 Please see the Folk Portrait Artists page for more information about Susannah Paine . Payne, Michael and Suzanna Rudnick, "Roses and Thorns: The Life of Susanna Paine", Folk Art Magazine, Winter 2005/2006, pp. 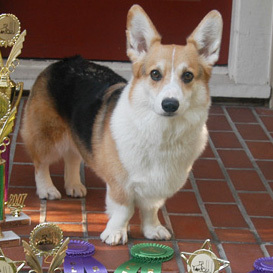 62-71. Payne, Michael and Suzanna Rudnick, "A Woman Can Paint a Likeness? ", The Magazine Antiques, January 2009. 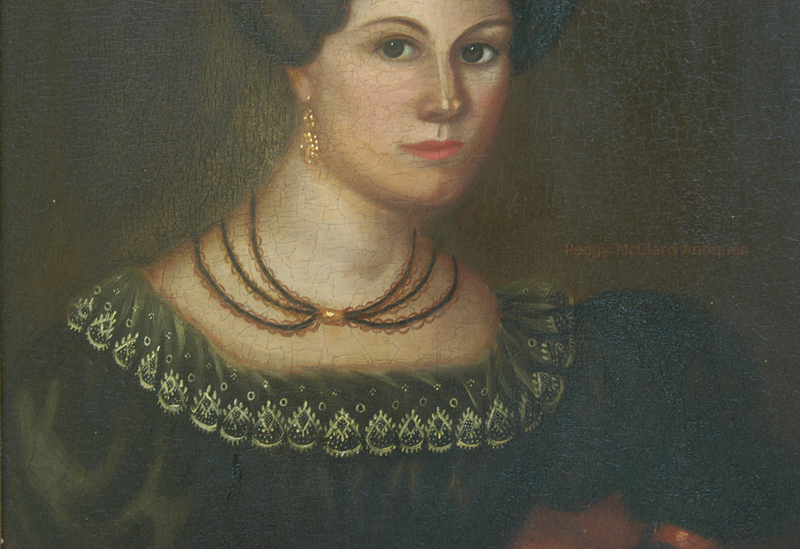 "Selected Works by Susannah Paine", Cape Ann Museum online. "A City Awakes -- Arts Flourish in Portland", Maine Memory Network, Maine Historical Society online. Portrait of George Morillo Bartol, Skinner Inc. online archives, American Furniture & Decorative Arts - Sale 2538B - Lot 52.